Stephanie Zimbalist in Fine Form as Katharine Hepburn. Stephanie Zimbalist excels as Katharine Hepburn in Matthew Lombardo’s thoughtful and thoroughly entertaining Tea at Five. The setting is the living room of Hepburn’s familial estate in Old Saybrook, Connecticut, and the time of the first act is 1938, just hours before a massive hurricane will send the house swirling down the river. Although this catastrophic event is not a part of the stage action, much else of a similarly devastating nature is, including the stories of Hepburn’s mother’s entry into feminist activism, the private tragedy that left Spencer Tracy’s son deaf for life, and the shocking fate of Hepburn’s older sibling Tom. This is not to mention the wide range of professional trials and tribulations that Hepburn endures on the way to becoming America’s most honored film actress. The heart of this play as drama is the way that the latter concerns-questions such as who will play Scarlett O’Hara, and when Hepburn will get another starring role-are subsumed gradually by graver, more universal dilemmas such as love, illness, life, and untimely death. In the first act, Zimbalist conveys the immense physical appeal of her subject. Jaunty in her habitual attire of tailored slacks and a blouse, the 31-year-old Hepburn looks every bit the glamorous star, and Zimbalist rises to the occasion admirably, turning slight bits of physical business, such as the imitation of another actress’s way of walking across the stage, into full-fledged scenes within the act. On the way to the intermission, we meet at least a dozen characters, all of whom are presented with clarity and grace. This is not to say that they are portrayed sympathetically. Some, as in the case of gossip columnist Louella Parsons, are positively reviled by the sometimes harsh and always opinionated Kate. Among the many facets of Hepburn’s character, her notorious arrogance is singled out for emphasis at several points, but, although there is little that’s endearing about her tirades, Zimbalist nevertheless manages to integrate the negatives into a larger whole. 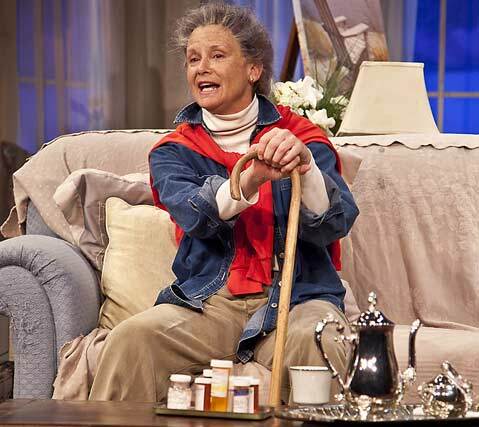 Act II finds an aged Hepburn dealing with a walking cast and the onset of Parkinson’s disease. This is the figure familiar from any number of celebrity impersonations, and it is to Zimbalist and director Jenny Sullivan’s credit that, without toning down any of it, the great star’s debilities do not become a simple spectacle. Instead, what we get is a complex and moving portrait of a woman determined to remain independent. The show’s final line is a resounding “yes,” and it is a sentiment that will be echoed by those who see this fine performance.